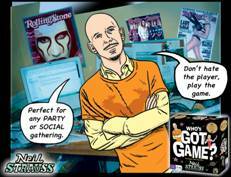 TheAngrySpark: Neil Strauss Asks: Who's Got Game? No really, he does. Neil Strauss is the world's "greatest pickup artist" and is the author of the NY Times best sellers The Game and The Rules of the Game. He's also hoping you like another type of game- board games. Both tomes mentioned above are Strauss' writings about the timeless art of seduction and meeting people. His new game 'Who's got Game?' was created to actually help grown men and women meet other real live human beings (IRL!) and interact with them. A terrifying thought? Maybe you just need to play the game. The game is comprised of ten different types of script cards, including revealing personality tests, fun physical challenges, social intelligence questions, secret persuasion missions, handwriting analysis and palm-reading games, partner-based conspiracies and more. Handwriting analysis?!? And all the analysing was done by one of the world's top experts in the field- Mark Baggett. Suddenly I feel like I'm under the hot lights. I mean, it doesn't sound like there's any kind of 'chute', 'ladder', 'room with a murder weapon', or 'pop-o-matic bubble' anywhere in sight. How can you have a game without a pop-o-matic bubble? If you'd like to find out, Who's Got Game will be available on February 6th through Barnes and Noble and Amazon. If you'd like to hear the word straight from the horses mouth, head on over to neilstrausspartygame.com for the full story. 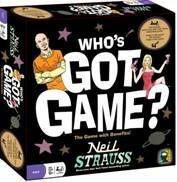 Labels: board games, card games, neil strauss, the game, who's got game?